If you’ve ever experienced neck pain or stiffness, you’ve likely tried some sort of traditional rotation exercise, such a simple side to side neck rotation in which the head feeds movement down into the neck and shoulders. This is just one way that the neck is moved in our daily routine. In some activities, such as food preparation, shopping for groceries, or even playing a game of golf or tennis, movement begins lower in the body and moves into the neck. In other words, the movement is reversed. To fully address neck pain, stiffness and weakness, we also need to include exercises that mimic some of these everyday activities. The hands are driving the movement upward into the neck, from the bottom up. Laurie Denomme is an award-winning international fitness educator. She’s helped thousands of people of all ages, experience, and fitness levels move and feel better. 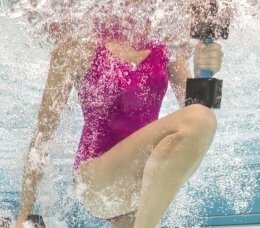 A kinesiologist and Fellow of Applied Functional Science through the Gray Institute, Laurie has more than 25 years of experience in aquatics. She serves as a contributor and subject matter expert for professional training manuals and writes for top consumer magazines, including Self and Weight Watchers. Try this activity to better understand how our neck moves. Sit in a chair, right arm in front at shoulder height. Look to your right. It’s easy to see and feel how your neck is rotated. Now try this. Begin with the right arm in front and head looking forward. Move your right arm at the same time that you move your head to the right. This should feel much different. While the head performs the same activity, the neck doesn’t rotate because the hand and head are moving together. Last test. With your head remaining stationary, move your right arm clockwise and counterclockwise. Did the neck rotate? Yes! This is an example of movement being driven from the hands into the neck, from the bottom up. This is how much of our daily movement occurs as we lift, reach and swing. Exercises that move the body in ways that mirror daily activities like these will serve our bodies best. To alleviate neck pain for good, this exercise can be performed daily on land or in the pool. In the pool, the water supports the arms, allowing for complete relaxation. Relaxed muscles are more free to move. Allowing the shoulders to be submerged for this exercise helps to further ease movement for best results. Check out the video to see step by step directions on how to perform my exercise that feeds the neck movement in a natural way. Mobility Check: Stand upright in a lunge, right foot forward and hands on hips. Look over your right and left shoulders. What is the last thing that you can see when you turn your head in both directions? Remember this. Stand upright in a lunge, right foot forward, left toe for balance. Both arms rest in front, just below the surface. Left hand reaches counterclockwise and clockwise just below the surface. If you were looking at a clock face, your hand would be moving from 12 to 6 o’clock. This arm movement will be the same throughout the entire exercise. As the left hand reaches, allow the left toe to act as a pivot so the body can turn with the moving arm. The left hip should be following the left hand as it reaches counterclockwise and clockwise, while the right hand remains still. If you feel any pain or discomfort as you progress through parts 1, 2 and 3, repeat the earlier exercise until you are ready to progress. As the left hand reaches 12 to 6 o’clock, vary the exercise with 3 different head movements. Head moves with the hand 12 to 6. Head moves from 12 to 9. Head is stationary looking ahead at 12. Repeat each phase of the exercise 3 to 5 times for 9 to 15 repetitions. Just like you did prior to the exercise, look over your right and left shoulders. Now what is the last thing that you can see when you turn your head in both directions? I’m confident you’ll find new range. This exercise is like chicken soup, feeding the neck the mobility it needs in a way that feels good.